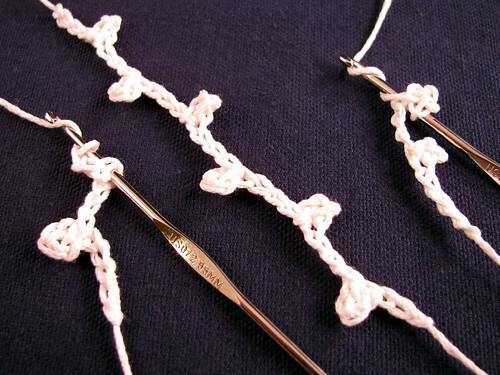 Here are my notes on how to make crochet picots on both sides of a chain. The picots facing right are made the traditional way. Crochet the desired number of stitches, 3 in this case, and then insert hook into the forth stitch from hook and pull yarn through both stitches on the hook. Donna Kooler recommends putting the hook in the little back loop of the forth chain stitch. That can be done too, except I think it stretches out the stitch more than making sure two strands of the stitch are behind the hook. To make a left facing picot, take the loop off the hook and put the hook into the forth chain from the end. This time make sure two strands of the chain stitch are in front of the hook. Now put the end chain loop back on the hook and draw the yarn through the two loops on the hook. It is tempting to draw the end of the chain through, but drawing a new loop though both stitches is better. Here is the best photo I was able to take. It shows picots on both sides of the chain pretty well, but not the how to part. Maybe if I get one of those setups where the camera is on a tripod and I can figure out how to release the shutter while both hands hold yarn and hook, I will be able to take more informative photos. Something else to figure out in my free time. This entry was posted on Sunday, February 22nd, 2009 at 3:00 am and is filed under Crochet. Tagged: Crochet. You can feed this entry. You can leave a response, or trackback from your own site. I think there is a foot pedal to trigger the shutter release available for some cameras…if I remember right.